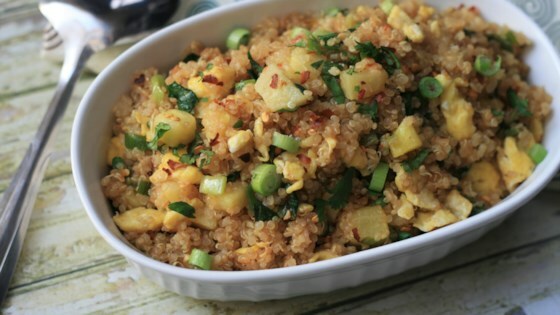 "Like pineapple fried rice, but with the ancient grain quinoa. Simple to make and bursting with Asian flavors! Always nice with fresh pineapple, but canned or frozen work well, too." If you love fried rice, then try this one out with quinoa too! Very good. I added frozen peas to get more veggies, used yellow onion instead of green, and only 2 eggs. The flavor was excellent! So glad to have a new way to use quinoa! I nice spicey rendition to my box.